On paper, Guardians of the Galaxy is Marvel's "biggest risk" since Iron Man, except that six years on from that independently funded feature, Marvel Studios has galvanised the movement of comic book movies that looked to be winding down around that time. That name sells a lot of tickets, even if the movie is a space opera starring a tree and a raccoon, from a Troma-trained director whose last two movies grossed the same in their whole lifetime as this one did from midnight screenings on its first day. In 1988, on the worst day of his life, young Peter Quill is abducted by aliens and whisked away into space. A quarter of a century later, he's grown up exactly as you might grow up in space if Star Wars and 1980s family sci-fi movies were your main source of reference for this sort of thing- he's a Han Solo-esque rogue who has dubbed himself Star Lord. 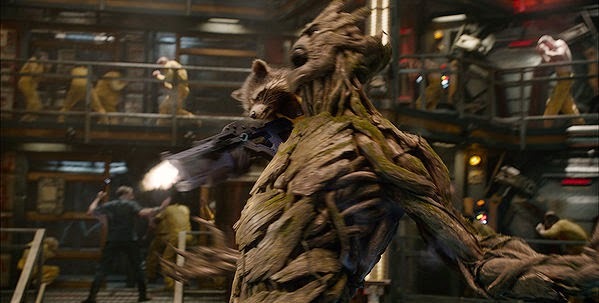 Robbing a mysterious orb brings him onto a collision course with professional assassin Nebula, incarcerated barbarian Drax, a big softy tree person called Groot and a talking, gun-toting raccoon called Rocket. They're all connected to the orb for different reasons, but find themselves united against the intentions of fanatical warlord Ronan the Accuser, who aims to use the artefact to destroy a planet. Marvel's Phase Two, hitherto spanning Iron Man 3, Thor: The Dark World and Captain America: The Winter Soldier, has thus far been defined by moving established characters around drastically in order to "top" the crowd-pleasing antics of The Avengers, but with one eye on setting up next year's sequel to that film, Avengers: Age of Ultron. That it's all built up to Guardians of the Galaxy gives this the air of a genuine game-changer, as much as that expression is overused. Even though this has a ton of exposition which will eventually feed back into the overall continuity, co-writer and director James Gunn's bouncier approach proves to be better than Thor 2's blatant McGuffin chasing. Stan Lee and the folks at Marvel Comics back in the day had an affinity for characters with extraordinary powers and ordinary hang-ups. While these reluctant Guardians are individually ordinary in their own extraordinary universe, their hang-ups are all the more sympathetic. And without the luxury of four or five solo films building up to this union of characters, Gunn goes right to the heart of each one. In a film with lots of big surprises, it's important that we don't understate the revelation of Chris Pratt, action hero. Though projects like Zero Dark Thirty had hinted that something like this might be coaxed out of the Parks & Recreation regular, who previously stole scenes as the schlubby best friend character in films like The Five Year Engagement and Delivery Man, that guy emerges fully formed as Quill- sly and charming but fundamentally a child at heart. This is the most immediately spot-on performance that the Marvel cinematic universe has revealed since Robert Downey Jr as Tony Stark. While he's definitely the leading man and the human face of a gang of aliens, it's a film in which every character gets a chance to shine and there are scene stealing performances all over the shop. Dave Batista is surprising in his performance as Drax, whose title belies the character's earnest motivation and comical ignorance. It's a great start to what should be a solid line of work as a Hollywood tough guy from here on out. Elsewhere, Bradley Cooper's voice work shows no obvious anxiety about digging into the brashness of a character called Rocket Raccoon, seizing many of the film's best jokes. Zoe Saldana, as the fierce and vulnerable Gamora, would almost seem like the calm centre, except that she keeps exploding into brilliantly choreographed and balletic fights with other characters, particularly in one confrontation with Karen Gillan's sinister sister-figure, Nebula. But the real scene-stealer, in a film almost entirely populated by them, is Groot. As with Rocket, there should probably be more credit to the animators than to the performers on this one, but kudos to Vin Diesel on finding so much to say in a voice role that consists almost exclusively of the same three word sentence. Either way, Groot amounts to a cuter, more gentle version of Chewie, who will make a generation of tree huggers out of us all. It wouldn't be hard to keep writing about the cast for the rest of the review, as it also counts Lee Pace, John C. Reilly, Glenn Close, Benicio del Toro, Peter Serafinowicz and Josh Brolin amongst its minor players. But the surprising factor in all of this is the James Gunn-ness of it all. As a fan of Slither and Super, I didn't expect that Gunn would get to make the film he wanted at Marvel, particularly when it all has to eventually fit into the producer-managed continuity. Without wishing to bury the lede by mentioning this so late, but this is a really, really funny film. Marvel is far more liberal with its humour than other contemporary franchises, (Christopher Nolan has become both the best and worst thing to happen to comic book movies) but Star Wars isn't the only film that this one evokes. In a big way, it reminded me of Ghostbusters- if you take the plot of that film in isolation, there's nothing that overtly suggests a comedy. It all comes from the script and the characters of Venkman et al. 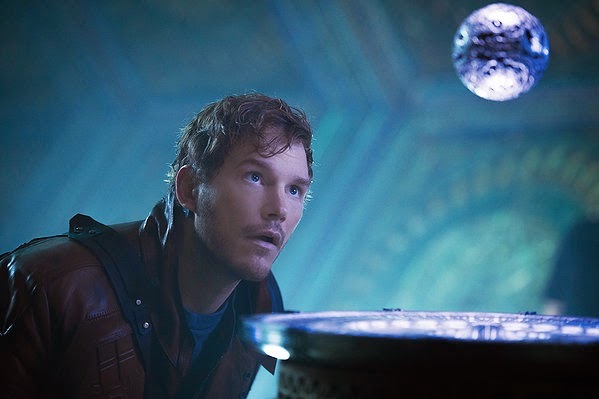 Likewise, this one, with its intergalactic tussle for an Infinity Stone could just as easily have been played straight-faced, but Gunn and Nicole Perlman have written the script with a willingness to run around making laser gun noises to an 80s mixtape pop soundtrack, and the characters and their sense of humour are what sets it apart as a winner. 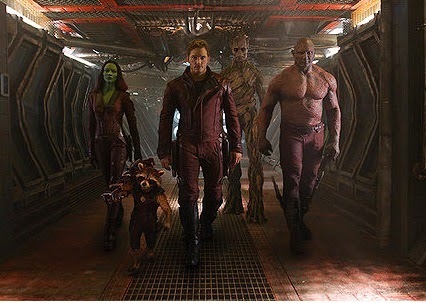 Guardians of the Galaxy is the funniest Marvel movie to date, but like Super before it, its raucous sense of humour doesn't obstruct the emotional connection to the characters, summed up best in a rousing monologue about how the only thing this gang has in common is that they're all losers, meaning "people who've lost stuff. 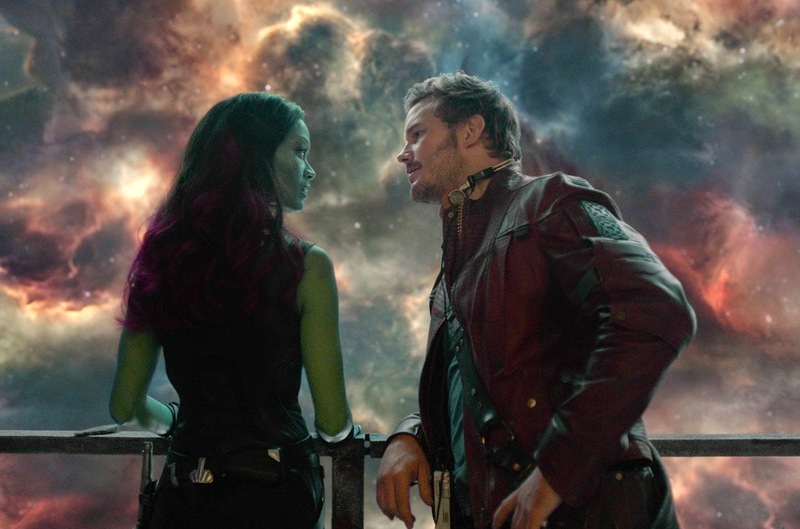 It excels by venturing outside of the territory that Marvel has thus far covered, playing more as a big, colourful, full-blooded space adventure movie of the kind that seems to have eluded blockbuster filmmakers for a long time now and it stands both within and apart from the studio's other movies. Guardians of the Galaxy is now showing, in 2D and 3D, at cinemas and IMAX screens nationwide. If you've seen Guardians of the Galaxy, why not share your comments below? Who's now got "Awesome Mix Vol.1" on loop?